The insolvency of multinational corporate groups creates a compelling challenge to the commercial world. As many medium and large-sized companies are multinational companies with operations in different countries, it is important to provide appropriate solutions for the insolvency of these key market players. 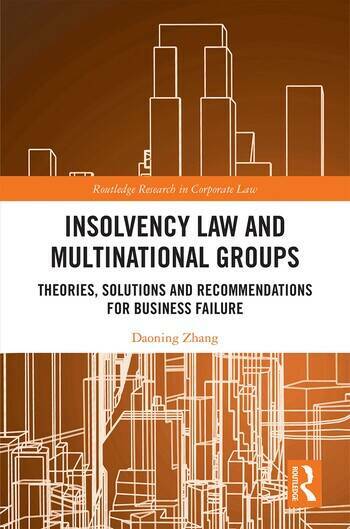 This book provides a comprehensive overview of the cross-border insolvency theories, practical solutions and regulatory solutions for the insolvency of multinational corporate groups. Whilst the book recognises certain merits of these solutions, it also reveals the limitations and uncertainty caused by them. An analysis of the new EU Regulation on insolvency proceedings 2015, the UNCITRAL Model Law on cross-border insolvency, the Directive on preventive restructuring frameworks and the Bank Recovery and Resolution Directive 2014, along with a study of directors’ duties will be included in this book. This book focuses on the insolvency and rescue of non-financial corporate groups. However, it is also important to recognise the similarities and differences between corporate insolvency regimes and bank resolution regimes. In particular, lessons learnt from bank resolution practices may be useful for non-financial corporate groups. This book aims to provide an in-depth examination of the existing solutions for the insolvency of multinational corporate groups. It also aims to view cross-border insolvency of corporate groups within a broad context where all relevant regimes and theories interact with each other. Therefore, directors’ duties in the vicinity of insolvency, preventive insolvency proceedings, procedural consolidation, international cooperative frameworks and bank resolution regimes are considered together. This book may appeal to academics, students and practitioners within the areas of corporate law, cross-border insolvency law and financial law. Daoning Zhang is a lecturer in law at Canterbury Christ Church University, UK; he obtained his PhD in Law from the University of Manchester.